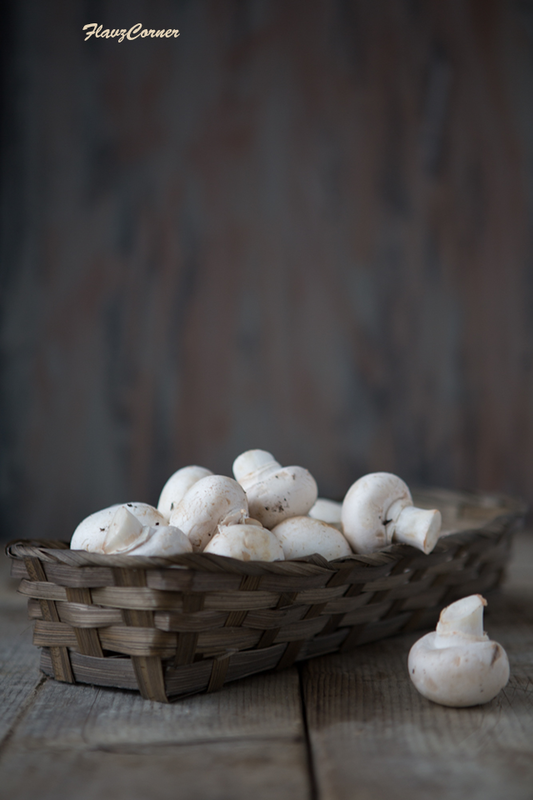 I love mushrooms and they are so cute when available in 8oz blue containers with their snow white color and button shape. I never think twice to pick up the mushrooms when they are fresh sitting in cute baskets in the farmer’s market aisle. Mushroom is a beautiful subject to shoot too. So the other day when I saw them in the market, I picked up 2 containers of these snow white cuties. I always get excited about buying stuff and then go into a passive mode of what to do next with it. As a blogger my notion was to take some fun pictures and come up with a recipe to blog about. I wanted to make something Indian and came up with this idea of making Theeyal, which is a flavorful curry that is made by cooking the vegetable in spicy roasted coconut gravy. Even though I don't make Theeyal that often, my kids could recognize the aroma of dry roasted coconut with shallots and spices. They knew that Theeyal was on the menu for the meal for the weekend. I always find it difficult to style soups and curries. They are tricky subjects to shoot. Mushroom theeyal is a usual fare in my Mom's kitchen, but this was the first time I attempted it and it was really delicious with steamed rice. I prefer it to have thick gravy than runny. 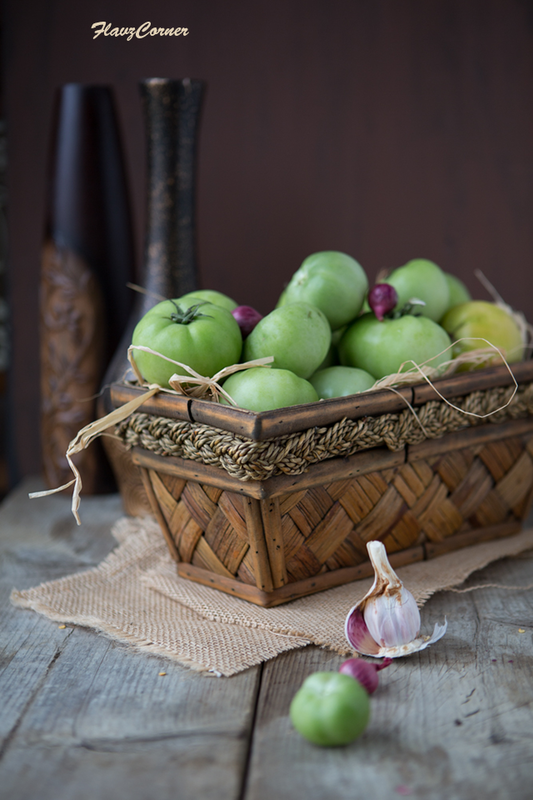 I made use of some green tomatoes in this recipe that I got hold of from fall season. Do you feel that you could have styled a subject better when you look back into the pictures later? I always feel so. There are only rare cases when I feel otherwise. Do you feel the same? Perseverance and patience are the basic aspects when you think about food photography and styling. Hope I develop more patience to take better pictures. 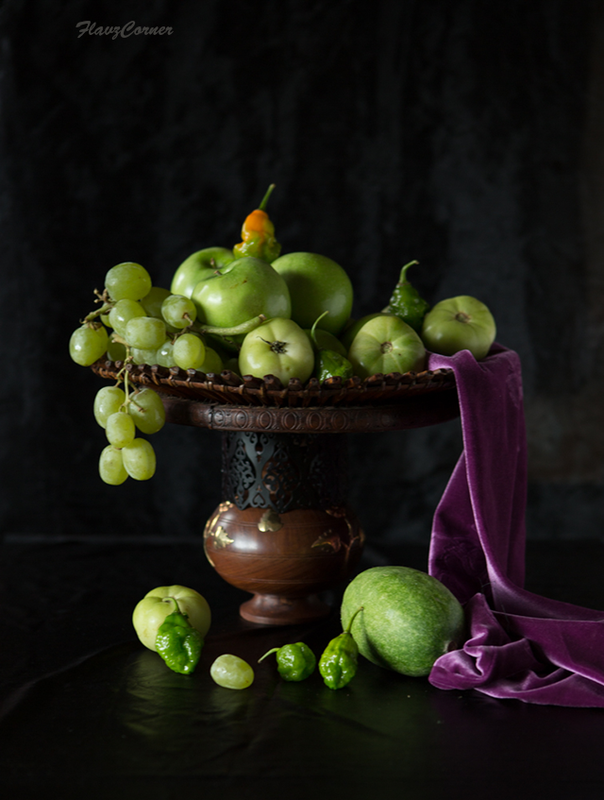 Above is a still life picture of green vegetables and fruits I took for fun. Dry roast the grated coconut and sliced shallots on very low heat in a cast iron pan or non stick pan for 15 - 20 minutes or till the coconut turns medium brown by continuously stirring. Add the coriander powder, chili powder and fenugreek powder and roast for 2 minutes on low heat. Turn off the stove and let it cool. Grind the dry roasted ingredients with 1/3 cup water into a smooth paste. Soak the tamarind in 1/2 cup luke warm water. Once soaked well, strain the pulp and save the water. Wash the mushroom and pat dry with kitchen towel. Cut them into half and slice the halves again into 3 pieces. In a non stick wok or deep pan, saute the mushrooms with onion and green chili in 1 1/2 tsp oil till the mushroom is cooked and all the moisture is absorbed. Now add the cubed green tomatoes and adjust salt. Cook it covered for 2 - 3 minutes till the tomatoes are cooked. Now add the coconut paste and tamarind juice without the pulp into the pan. Add 1/2 -1 cup of water if the gravy is thick. Cook till gravy boils for 2-3 minutes. Adjust the salt. Turn off the burner. In a non-stick pan, splutter mustard seeds in 2 tsp of oil. Add the shallots and dry red chili and cook till it gets golden brown. Turn off the burner and add the curry leaves to the tempered onions. Garnish the Theeyal with the tadka/tempered mustard and onions and serve the Theeyal with steaming plain rice and seasoned buttermilk. 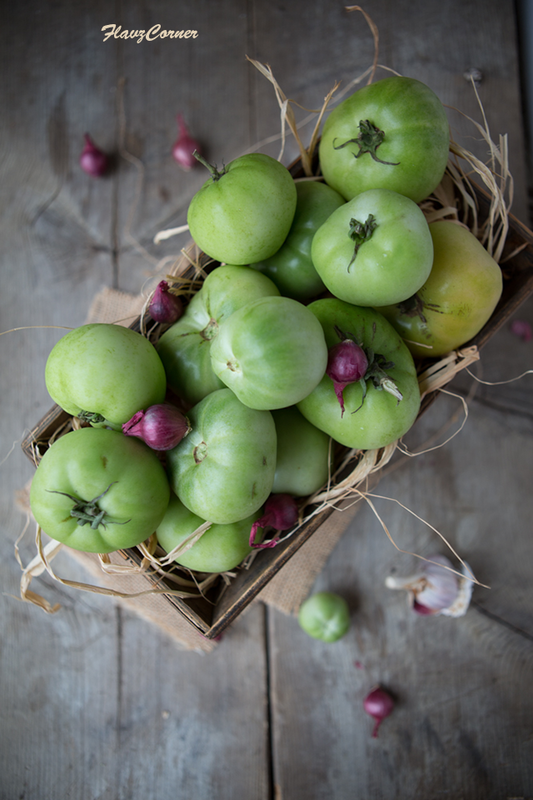 You can use a ripe tomato instead of the green tomatoes. In that case you have to adjust the amount of tamarind paste to get the right amount of sourness to the curry. Make sure to saute the mushroom so that the water is absorbed well before you add the green tomato because you want to overcook the tomatoes so that they will lose its shape. I like theeyal to be thick rather than runny. Adjust the amount of water per your desired consistency. If you don't have a good blender, use a spice grinder/clean coffee grinder to grind the warm dry roasted coconut till its powdered well and the ground coconut starts to stick to the sides. Now transfer this into a blender and add enough water to grind it into a smooth paste. Alternatively you can freeze the grated coconut for 30 minutes and pulse the frozen coconut in a food processor to get small flakes. This will help to get the coconut evenly roasted without burning. It is important to roast the coconut well to attain the right taste and to get a smooth coconut gravy. If the coconut is not roasted well, it is hard to grind it into a smooth paste and the theeyal will not impart the authentic flavor. Make sure that you don't over roast the coconut and burn it. Alternately you can freeze the grated coconut for 30 minutes and then pulse it in food processor to get a course powder. This will help to get evenly roasted coconut while dry roasting it with shallots. 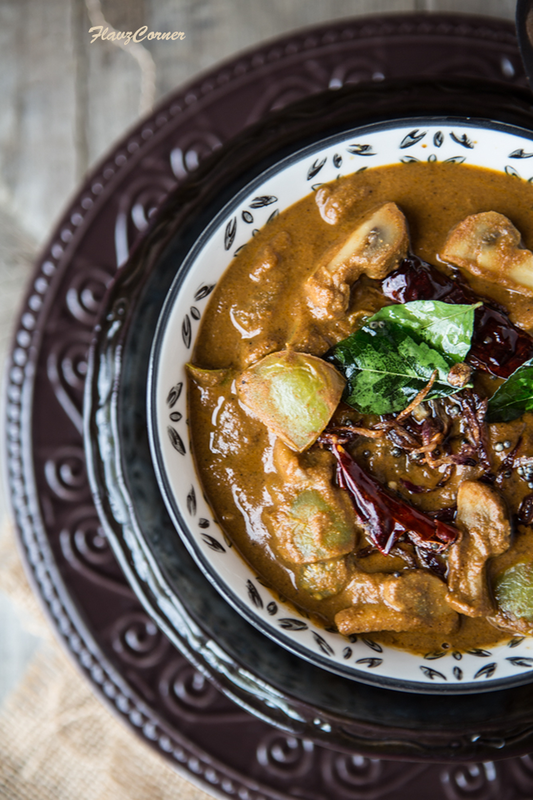 We make some varutharacha curry with mushroom and theyal sounds even better option. The roasting of the coconut with spices is nothing shot of aroma therapy for me. I just love when kids smell and say whats on the menu that day.Lovely looking pics. Perfect for the cold weather here! 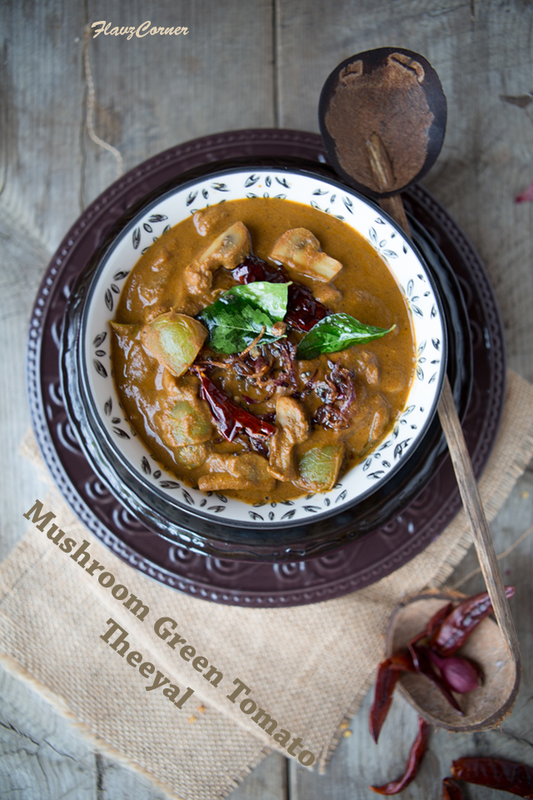 I love green tomatoes and this curry with mushroom sounds so tempting! So flavourful and delicious, Shibi. And beautiful clicks as always! So delicious and full of yummy flavors. Never tried mushroom and green tomato combo, I bet it was deeeeeelicious. I have never cooked mushrooms to go with rice... this theeyal sounds like a delicious idea... the picture of the tomatoes looks like a painting! I love that shot of green tomatoes...god job Shibi..
Shibi, that is one yummy looking dish. The pictures here are simply stunning and those tomatoes, perfect. That curry looks so much like my mum in laws and I miss it so much. absolutely delicious with some rice, yum. Craving it now. Hope you are doing great my dear. LOVE mushrooms! So much fun to cook with. And I agree with you, to photograph! This curry is awesome -- love the inclusion of green tomatoes! Thanks so much. 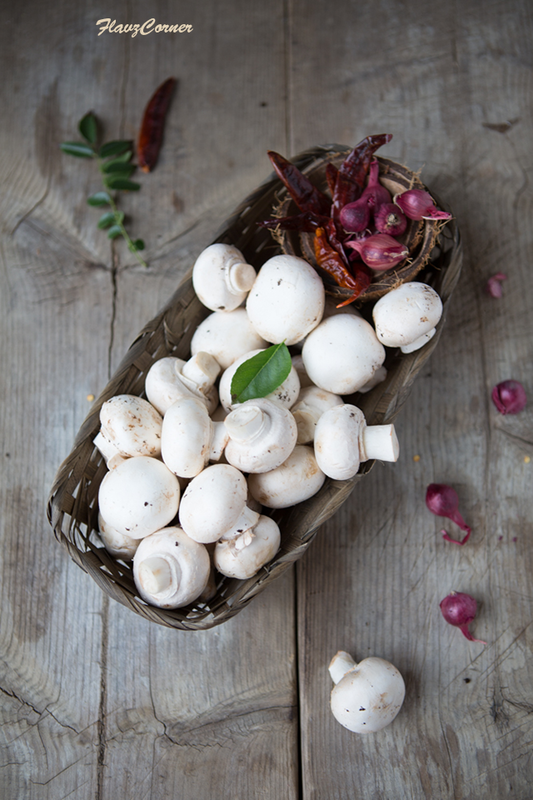 Love mushrooms and this curried recipe sounds lip smacking good. Beautiful clicks dear, especially the top shop of mushrooms and the moody pic with grapes hanging down. And I totally agree with you that patience is certainly the key to good photographs. Its seldom happens that I am totally satisfied with a blog post pics. Something or the other in the pics is always leaves me wanting for more. I guess practice is the key.